behavior to more persistent actions towards the end of adolescence. Although all ages reacted to the cooperation received in the previous round, young teenagers mostly responded to what they saw in their neighborhood regardless of their previous actions. Decisions then became more predictable through midlife, when the act of cooperating or not was more likely to be repeated. Our results show that mechanisms such as reciprocity, which is based on reacting to previous actions, may promote cooperation in general, but its influence can be hindered by the fluctuating behavior in the case of children. 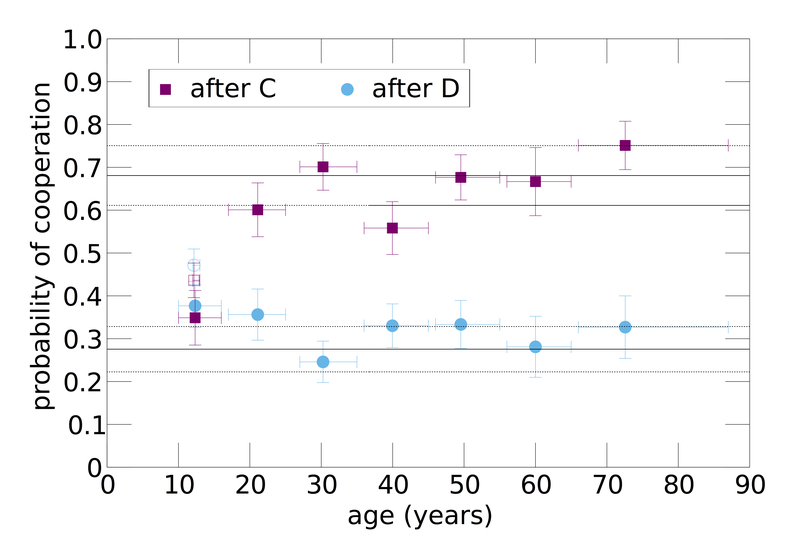 M. Gutiérrez-Roig, C. Gracia-Lázaro, J. Perelló, Y. Moreno, and A. Sánchez, “Behavioral transition with age in social dilemmas: From reciprocal youth to persistent response in adulthood”, Nature Communications 5:4362, doi:10.1038/ncomms5362 (2014).